Set in a purpose-built development next to a delightful square this spacious three bedroom flat is bright and quietly located with swift links into the City and Docklands. Amazing coffee house with such good coffee and lunchtime food. Great smoothies too! 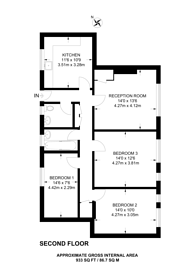 933 (86 Sq M) approx.